Recently finished writing a book, The Courage to Go Forward with David Cordani, CEO and President of Cigna. It permitted me to reflect back over thirty-five years. Achilles has helped make the world a little better for people with disabilities. Let me explain how, by describing some of our major programs. They are first, a large network of national and especially international chapters; second our Freedom Team of wounded, ill and injured veterans; third, the Hope & Possibility® races; fourth, Achilles Kids; and fifth, the Marathon Tour. We currently have 29 Achilles chapters throughout the United States ranging from New York to California and Texas to Minnesota. Our first and largest is in New York City. It has multiple groups and several programs. One, for example, with Rusk Institute, part of NYU Medical Center, focuses on people with Traumatic Brain Injuries (TBI). There is some evidence that if you have a TBI, running may improve cognitive and social skills. This requires additional study. We also have three wheelchair basketball teams. There is a tennis program and a Kayak race sponsored by Achilles. In addition, there is a program with the Friedman Diabetes foundation in which we focus on walking, jogging and running as a method of treating diabetes. Finally, we have a very large Triathlon Team including many Ironman competitors. Our members typically enter one mainstream race a month. Achilles International has teams in forty-one countries and presence in over seventy. A few of our largest chapters are in Canada, New Zealand, Germany, Brazil, South Africa, Mongolia and Japan. In several countries we are a leading force in the disability community. Tokyo has over four hundred visually impaired members. New Zealand has chapters in nine cities and Mongolia is responsible for a very successful Hope & Possibility® race with 3300 participants. In a number of countries, we are at the forefront of mainstreaming the disabled population. Our first research project was conducted in Norway and illustrated that if you have Cystic Fibrosis and run, your life expectancy increases. Our Freedom Team began in 2004 at Walter Reed Army Medical Center. Soldiers wounded in Iraq and Afghanistan were introduced to competing in marathons with a handcycle. It is a profound success. While undergoing surgery and rehabilitation, they are participating in mainstream running events. A favorite quote by a member, “Sir, may I postpone the surgery by a week so that I can compete in the Boston Marathon?” Several hundred wounded veterans have competed in marathons. Many, including double amputees, have used artificial legs to run. Not only has it helped them improve physically, but it has introduced goal-setting, competition, and achievement into their lives. Several are currently world class athletes and Paralympic competitors. The Hope & Possibility® race, introduced in 2003 focuses on integrating able-bodied and disabled athletes competing together. This event provides several categories and prizes for people with disabilities. Amputees, for example, compete with others for prizes. The idea is to encourage mainstreaming. Our largest H&P is in New York where the race is sold out and includes several hundred disabled competitors. There are H&P races throughout the United States and internationally. We compete in Munich, Germany; St. Petersburg, Russia; Ulaanbaatar, Mongolia or more easily, in Nashville, TN. The race was named after board member Trisha Meili’s book, “I am the Central Park Jogger: A Story of Hope and Possibility”. Achilles Kids includes our largest population. Over 11,000 disabled children run, typically in adaptive programs in 350 schools throughout 21 states. 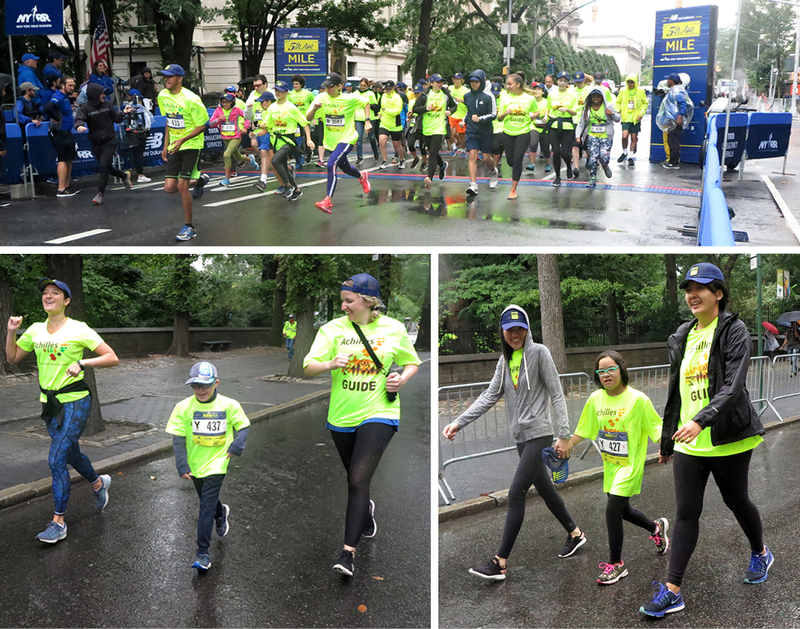 Each child receives a customized map of their city, borough or location with a 26.2-mile course outlined. It’s a virtual marathon that the students complete by running/walking laps each week. The children, with their teachers, track the mileage on their maps. The goal, during the school year, is to complete the distance. Awards include a T-Shirt, certificates, a silicone bracelet, half marathon and marathon medals. We recently completed a study at five schools with the support of the Cigna Foundation which showed that for children who are on the autism spectrum and run, there is significant improvement physically, socially and cognitively. The Marathon Tour is a series of twelve marathons throughout the United States in which we field teams from twenty-five to three hundred disabled members. It begins in the fall with Chicago, Detroit, Marine Corps, New York and continues through Miami, Orlando, Palm Beach and Boston including others. Our biggest is the NYC Marathon. This year over three hundred Achilles members including almost one hundred in handcycles and wheelchairs will compete. They will represent 32 countries and seventy-one chapters. It is our celebration of growth, having begun with 6 members in 1983. Over twenty-five members have TBI. We initiated the first published correlational study associating running/exercising with cognitive improvement. Trisha Meili is one of the co-authors. What we are doing is focusing on mainstreaming, the group as a force of motivation, goal-setting and achievement. It is my belief that the group, which we consider a micro-community, is the most powerful tool anywhere to motivate. As people achieve, the next thought is, “What’s my next goal”? In addition, our disabled athletes, completing marathons have an additional advantage...they wear a halo! People see them not as a person with a disability, but as someone akin to Horatio Alger...a hero. As we celebrate our 35th Anniversary, I have had the privilege to describe this process in our book “The Courage to Go Forward”. I hope you get the chance to read it. #GoAchilles! DON’T FORGET TO CHECK OUT OUR ACHILLES E-STORE! In conjunction with our premium apparel partner Champion System, a worldwide leader in custom technical apparel, new pieces and Achilles classics are now available for purchase here. Don't forget, if you shop at Amazon please shop at https://smile.amazon.com. When you shop here, the AmazonSmile Foundation will donate 0.5% of the purchase price of eligible products to the charitable organization of your choice. Be sure to select Achilles! This can generate a lot of money if we can make it a simple habit for 10,000 people on our contacts + thousands of others in our personal social media contacts. Thank you! If you are joining us for any of the four marathon weekends---we cannot wait to have epic experiences with you and witness your glory and the power of the Achilles spirit!!! It’s always a good time to note some of our major sponsors during the start of our marathon season! Big thanks to The Moody Endowment, Michelob ULTRA, the GM Military Discount, DAV Charitable Service Trust, The Union League Club, and The Altschul Foundation for supporting our athletes and our programs this Fall. Sunday September 9th was a dreary, rainy day. A perfect day to stay inside - perhaps with a good book or video. BUT NOT FOR ACHILLES KIDS! The rain didn’t damper their spirit one bit! Over 25 Achilles Kids members and their dedicated guides (who also could’ve been sleeping in!) - stepped up to the starting line near the metropolitan museum and CHARGED down 5th Avenue with such joy and determination! An AMAZING day! Diego led the pack with an astounding time of 6 minutes and 32 seconds with Noah, Julian, Christine and John not far behind, followed by the rest of our amazing Achilles Kids runners! We are SO VERY PROUD of all of you! The sun came out the following weekend when we held our Volunteer Appreciation Day brunch at our Central Park workout. Thanks to our wonderful families who donated an awesome array of yummy goodies coupled with the outstanding planning and organizing efforts of our three AMAZING volunteer leaders - Angie Bullaro, Carolyn Wynne and Theresa Molloy - we put on one incredible spread! With bagels (plus all the extras), donuts, cookies, coffee, (regular AND Irish!) hot chocolate, orange juice (AND mimosas!) It was a fabulous celebration of all the caring, dedicated, devoted and fun folks who so freely give of their time and energy to help our kids reach the finish line! This fall we have two more very exciting races coming up for our Achilles Kids. The Terry Fox 5K Run on October 13th and the Dash to the Finish 5K on November 3rd! Look out for our awesome athletes - they are on the MOVE! Our school program is also on the move! We are thrilled to have added schools in 11 new towns in Maryland, as well as several more in NYC, upstate NY, Massachusetts, Ohio and Pennsylvania! What a FANTASTIC way to kick off our program - Achilles Kids 25th year! Achilles Kids charging down 5th Ave at the NYRR New Balance Fifth Avenue Mile. Ricardo Corral has won the 5th Avenue Mile race 15 times!! This year, he was awarded a Proclamation from the Mayor of the City of New York for helping the community and athletes on behalf of Achilles International NY and Ecuador. Well done, Ricardo! We are so proud of you! Join us on Thursday, October 4th for an evening of cocktails, hors d'oeuvres, and celebration of the Achilles community as we gear up for the fall race season! Meet incredible athletes and guides and learn how you can support Achilles. Please click here to purchase your ticket! Casual Cocktail Attire. Event Details! Thursday, October 4th 7:00 P.M - 10:00 P.M.
We are proud to partner once again with Arch Global Advisors for the Third Annual Day of Golf to Benefit Achilles International on Wednesday, October 3rd at Anglebrook Golf Club in Lincolndale NY. The festivities kick off at 9:30 a.m. for breakfast and registration followed by an 11:00 a.m. Shotgun Start! The day concludes with cocktails and a 5:00 p.m. dinner and awards ceremony featuring remarks by Achilles athletes. All proceeds from the event will go to benefit the New York City Chapter of Achilles International. On Thursday November 1st, join us as we celebrate the "Remarkable Women of Achilles". Honoring Achilles Athlete, Minda Dentler, Co-Host of The View, Meghan McCain and TD Bank Executive, Tyrrell Schmidt on November 1st at the Union League Club, NYC. Auction and Cocktails at 6pm. Dinner at 7pm. Business Attire. Here is the link to purchase tickets. Friday, November 2nd 6 pm to 9 pm @ The Hotel Pennsylvania, 401 7th Avenue between West 31st and 32nd Street, Penn Top Ballroom, 18th floor. This dinner is for all Achilles athletes participating in the 2018 TCS NYC Marathon, their Guides and Marathon Charity Entrants. Suggested donation of $40 for each guest that is not an official athlete or guide - donate online. Patti joined Achilles in 2017 and hasn’t stopped since! She ran the TCS New York City Marathon the same year, guiding “The Ultimate Running Machine”, John Pierre and has remained an active volunteer ever since. Thank you, Patti, for everything you do for Achilles. How and when did you first hear about Achilles? I first heard of Achilles when I started running races. I would see the athletes with their guides. It was always inspiring, and hearing everyone calling out to cheer Achilles, reinforcing what the running community is really about. That has always been a favorite part of races for me. When did you first become a volunteer/guide? I became a guide in July of 2017. What has that experience been like for you? It has been incredible! I tell everyone that they should consider volunteering for Achilles. You meet the best people, get to run with inspiring athletes, and get to share something really meaningful. Describe one or two special memories being an Achilles volunteer/guide. Last season, John Pierre (“JP”) - the Ultimate Running Machine - went through a deep personal loss. The way his Achilles family came together to support him is something I will never forget. So many people went above and beyond for him. Finding so many people with such heart and caring is really special. Please name one or two athletes you have guided. I guided JP, the Ultimate Running Machine, for the NYC marathon in 2017. Is there anything you would like to bring to the public's attention about being an Achilles Guide? I am someone who enjoys running on a team and that is what being an Achilles guide is - a team. I know some people worry about commitment or are intimidated by what they imagine guiding will be like. I would want them to know that all they have to do is show up with their personality and their talents and join a family that will appreciate them! Mention a little about your background. I grew up in Canarsie, Brooklyn, and moved to Staten Island when I was in high school. I was not a runner growing up, I didn't do anything remotely athletic! I am a high school librarian. I guess my other interest is learning, because I just started my third Master's program. Anything else you might like to add? Achilles Connecticut - on October 13th Achilles CT has a team of 75 in the Eversource Hartford Marathon, Half and 5K, including Romel Palis from New York City and Cathy Beaudoin from California. For the fifth year in a row, Achilles CT is an Official Charity Partner, this year at the Gold Tier level. Jillian Harpin, from Wolcott CT, was in the September 10 issue of People Magazine!! The Achilles Los Angeles Chapter meets weekly on Sundays at 9 am along the Santa Monica coast. Here are photos from the chapter's participation in the Santa Monica Classic last month. Achilles Madison Wisconsin Chapter recently celebrated 13 years together. The Madison Chapter's end of summer picnic at Garner Park - a great group of folks, yummy food, beautiful weather - can't ask for more. Achilles will be welcoming athletes from various U.S. chapters to do the TCS New York City Marathon: Connecticut, Boston, Nashville, Philadelphia, Pittsburgh, and Greater Phoenix. Two visually-impaired athletes from our Charlotte North Carolina chapter - Eric Strong and Joe Sheerer - will be doing the Charlotte Marathon on Saturday November 3rd and New York Marathon on Sunday November 4th!